The morning starts somewhere between 5 or 6 AM. 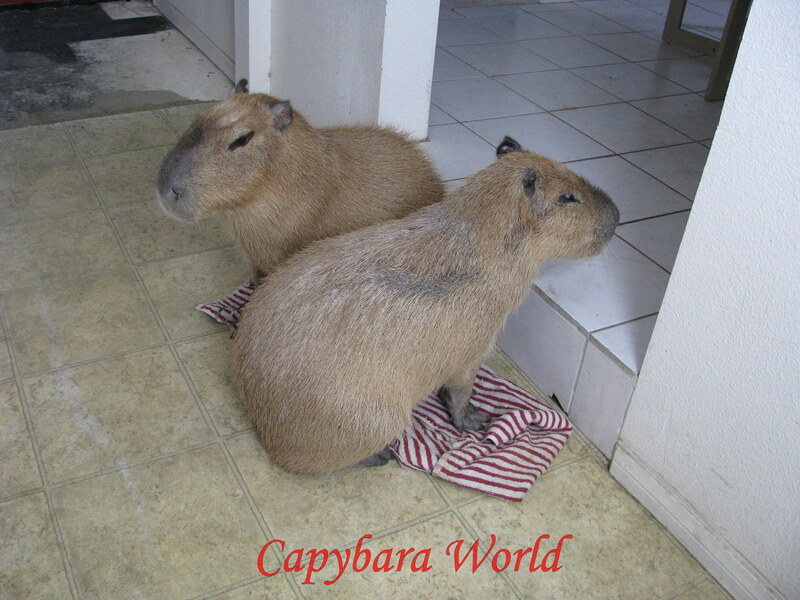 The capybaras will awake with a trip to the potty pan and chuckle their way into the kitchen for their morning milk. Then it’s back to the bedroom until 7 or 8 AM, stopping off for a bite of hay or guinea pig food and perhaps another visit to the potty room. The capybaras rouse themselves with a great deal of yawning, stretching and chuckling to make sure you wake up and to show that they are ready for their maize (a type of corn that is not sweet, which they get in winter to supplement their diet). When the Capys want their morning corn they eep plaintively, pointing their noses at the refrigerator, where they know their corn is kept. The eating of the corn takes about half an hour, after which they enjoy a bowl of warm water and then it’s time for the mid-morning nap in the sun which lasts until noon or 2 PM, and is only interrupted by the occasional trip to the potty pan and the occasional sparring match. This video shows Romeo and Tuff’n getting out of their spa as their dinner arrives in the back garden. Romeo and Tuff’n adore their maize, and demand to be fed earlier and earlier. 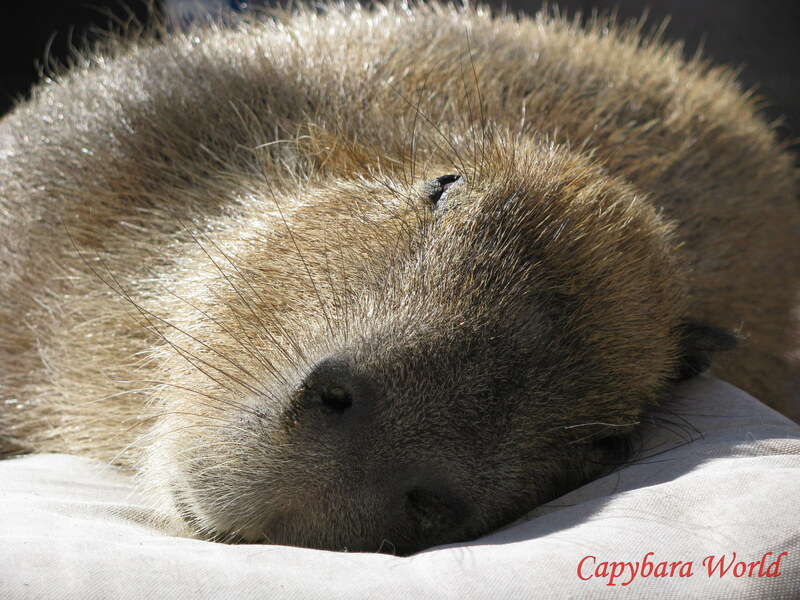 First it was 10 o’clock in the morning, then it was moved back to 8 o’clock in the morning, then 6 o’clock in the morning, then midnight and now they expect to be fed at 9 PM on the dot; capybaras like most animals have an excellent sense of time. Tuff’n has even learned to say “corn”! However in the presence of the camera and the spotlights he was tongue tied. The oil in the maize has brought a sheen to their coats. Romeo and Tuff’n are now ready to go to one of their many favourite parks and they do not like to be kept waiting. If they are not loaded up to go to the park they get quite frustrated and begin to protest and cause mischief. They will bring their leashes over to you, as a gentle hint, but if the delay continues they begin to play fight or defecate in inappropriate places. Romeo and Tuff’n go to the park to eat grass every day, rain or shine, for 2 to 3 hours. Muddy Romeo at the Park. Romeo loves to roll in the mud. He also loves standing on his hind legs and rubbing his morillo on his leash. Sometimes Romeo and Tuff’n go to Lake Mead where they love to swim in the huge lake and eat aquatic plants. When they arrive home their first stop is a trip to the potty pan for a giant pooh, unless of course an accident has happened in the car, for which Marvin and Elizabeth are well prepared with a tarpaulin and several incontinence mats. This is followed by a bath in warm water after which Romeo does a little dance of joy as Marvin sprays him. Tuff’n is still apprehensive of the jet of warm water. Romeo and Tuff’n go into the kitchen for their evening milk and sit quietly on a towel waiting for the milk to arrive, facing in opposite directions in case a predator appears. Romeo goes into an almost trancelike state, he is so incredibly calm and patient while he waits for the milk to be prepared. And then it’s time for a swim. Romeo, Tuff’n and Marvin in the pool. 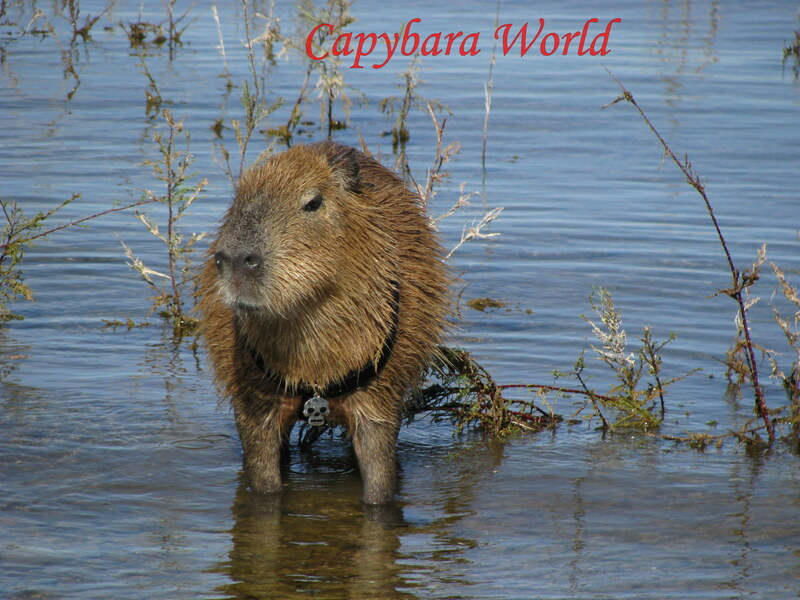 The pool has been specially treated so the water is not harmful to the capybaras. Then back to the hay bales and another trip to the potty pan. Occasionally they will take in some television, but most often they will just retire to the bedroom and wait for someone to join them. Sometimes Romeo waits at the entrance to the bedroom for Elizabeth to arrive. Elizabeth has a mystical ritual which Romeo and Tuff’n love. The lights are turned down and an ambience of peace and serenity ensues. First Romeo is covered with his favourite blanket so that only the tip of his nose is showing. Then Tuff’n, who until recently did not like having his head covered, is covered with his favourite blanket. Elizabeth then communes silently with each of them nose to nose and sometimes joins them on the bed. This is a quite magical scene. When Marvin comes to bed Romeo puts his head on Marvin’s shoulder and snuggles up beside him, as close as he can get. Tuff’n starts the night at the end of the bed but very often Elizabeth awakes to find Tuff’n snuggling in her arms. 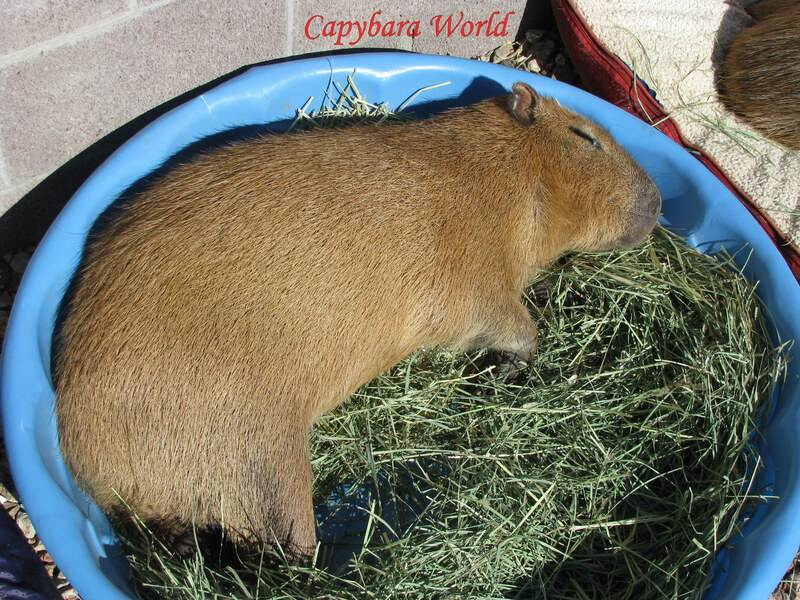 The capybaras tend to sleep most of the night except for several trips to the potty pan. After each trip Marvin or Elizabeth will get up and empty and clean the potty pan. 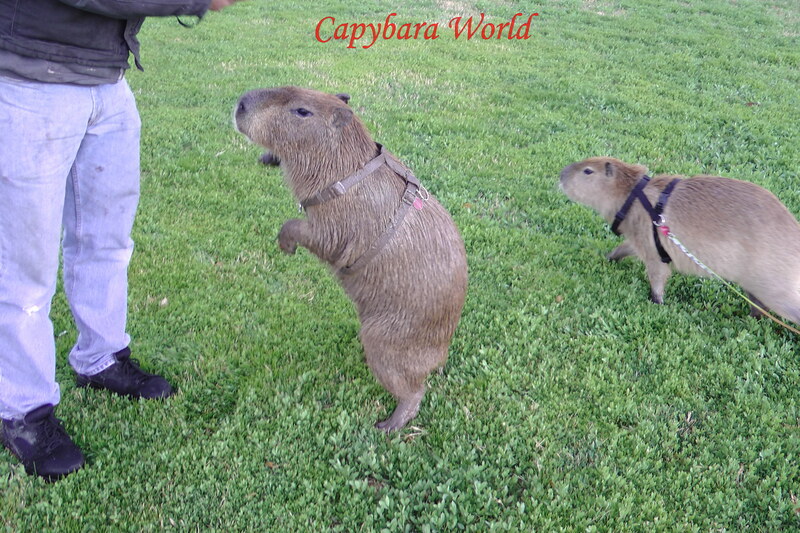 Capybaras enjoy a routine. They can tell what time of day it is, and sometimes if their humans have not stayed on schedule they will protest by missing the potty pan or using their teeth to tug on your trouser legs, or by gnawing on their leashes, to remind you that they are not pleased with the service they are experiencing that day. You will find yourself apologising to the capybaras for making them wait for their dinner because you are cleaning their potty pans: “Oh I’m sorry. I didn’t realise you were waiting for your milk”, when Marvin, the slaveboy, had been elsewhere cleaning the potty pans and hadn’t noticed that his VIP Romeo was waiting for his milk. 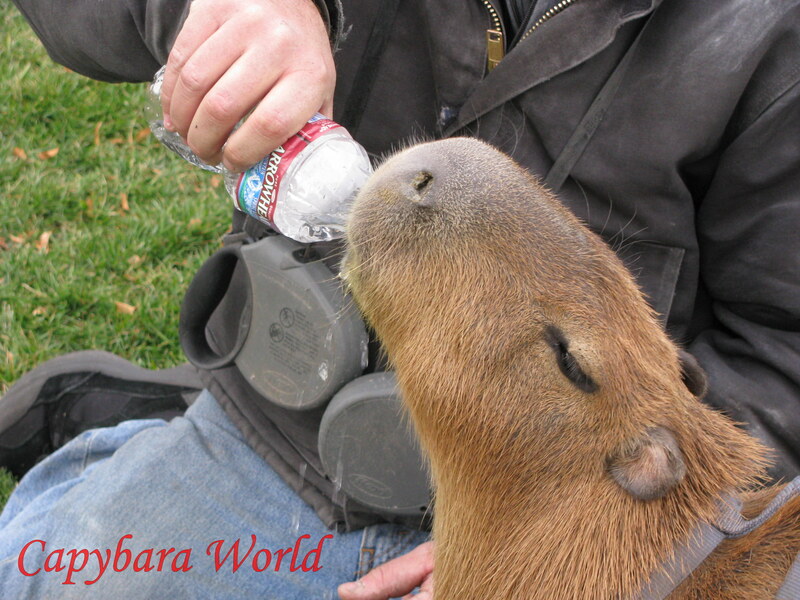 Capybaras are very high maintenance and demanding! Capybaras find humans easy to train, as they soon find out! You may think you are training them, but in reality they are training you. 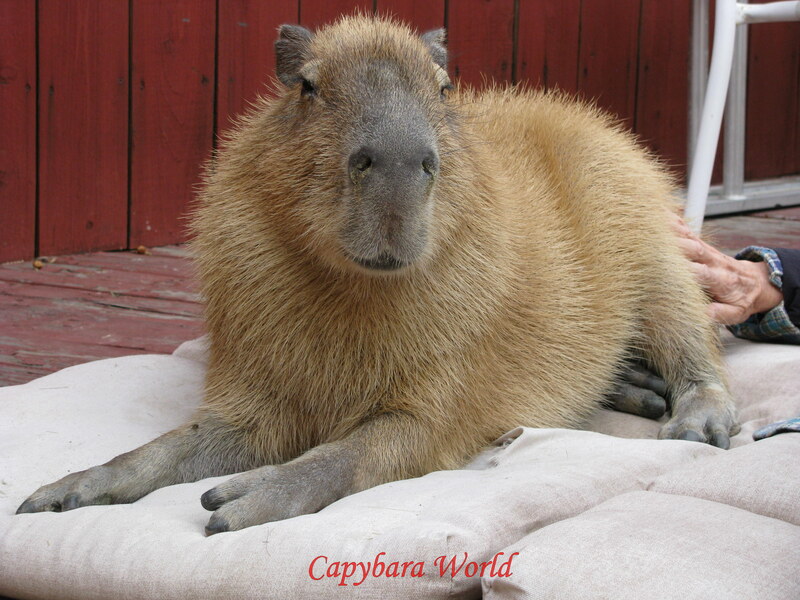 Capybaras are highly intelligent and emotionally very sophisticated. They have excellent memories and never forget, often scheming for several days before coming out with some clever strategy to ensure a situation is turned to their advantage. They have well thought out strategies to ensure their desires are met. For example, on one occasion while Marvin and Elizabeth were asleep in bed at morning milk time, Tuff’n sat by the potty room door and called plaintively for Romeo. Marvin got up to help direct Tuff’n to Romeo’s location which Marvin assumed would be on the hay bale in the dining room. However, instead of Marvin leading Tuff’n to Romeo on the hay bale, Tuff’n lead Marvin to Romeo sitting on his milk mat in the kitchen waiting for his morning milk! On the way Tuff’n kept looking back at Marvin to make sure he was following. Tuff’n then sat down right beside Romeo. Romeo and Tuff’n have a different call for each member of the herd, human or capybara. Capybaras pooh approximately every 2 hours. You will be emptying the potty pan at least 10 times a day. This can often be a messy, backbreaking procedure. It put my husband right off living with a capybara! Video: After an afternoon grazing in the park and rolling in the damp, soft earth Romeo and Tuff’n love to play in the spray. Video: Marvin wakes Romeo who has been fast asleep, nestling under the bed covers at the bottom of the bed. Romeo knows exactly what Marvin wants him to do but he is enjoying exerting his own authority and not complying with Marvin’s wishes. At about 1.39 minutes you can see the hair rise on Romeo’s neck and back as he really revels in his own power to do what he wants rather than give in to Marvin’s authority. Video: Romeo and Marvin play a game called “Little Field Mouse” in which Marvin feeds Romeo the choicest pieces of hay, the sweet dried grass flowers. Sometimes they share a flower. Romeo loves the game and it makes them feel very proud and important. To me this is so much more rewarding, playing games in a language, using words and phrases which Romeo understands, than teaching senseless tricks. I am pleased to see that a growing number of animal connoisseurs and aficionados are against teaching animals tricks. Tuff’n provides the vocal accompaniment; you can hear him singing. This entry was tagged Adorable, Animal, かわいい、ネズミ、動物園、靖、イオ、アキ, かわいい、愛らしい, かわいいカピバラ、, べる, アキ、, カピバラ, カピバラ ペット, カピバラペット、, ドングリ, メイプル, ロメオ、, bus花、カピバラ、バク、カバ、植物、庭園、熱帯、フラミンゴ、宿泊施設、鉄道、バス, capincho, capivara, Capy, Capybara, carpincho, chiguire, Cute, капибара, очаровательны милые водосвинка, Eep, 長崎バイオパーク, 靖, Giant, Giant hamster, Hamster, rat, Romeo, ronsoco, Tuff'n, Vízidisznó, Yasushi, 巨大なハムスター、. Bookmark the permalink. I enjoyed this very much and I loved the photos. Very well done, we appreciate all the hard work. 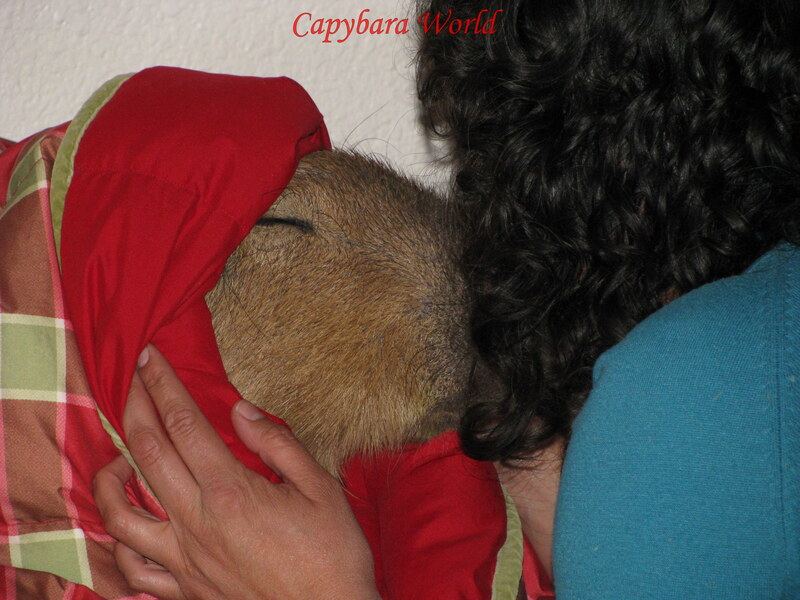 We feel it is very important that people know what a commitment Capybara caretaking is. Thanks very much Marvin and Elizabeth, but the credit should go to you. And I completely agree about the commitment. 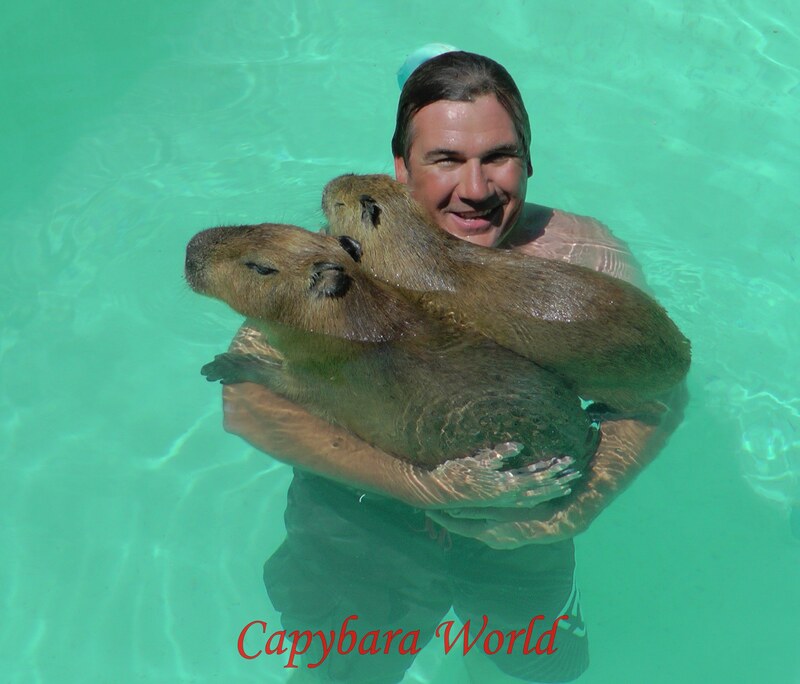 I think most people have no idea how much love and understanding and effort is required to ensure that a pet capybara is happy and healthy. Yes I know what you mean Vance! I had the rare opportunity of meeting Romeo, Tuff’n and owner at the park and they are AWESOME! It’s very apparent that you are a really good owner. They are very well taken care of and very sweet. Thanks very much for your kind words and taking the trouble to comment. I’m so glad you love them. They are fantastic animals and so affectionate, but I don’t think many people could give them a happy home as a pet. Have you thought of guinea pigs? 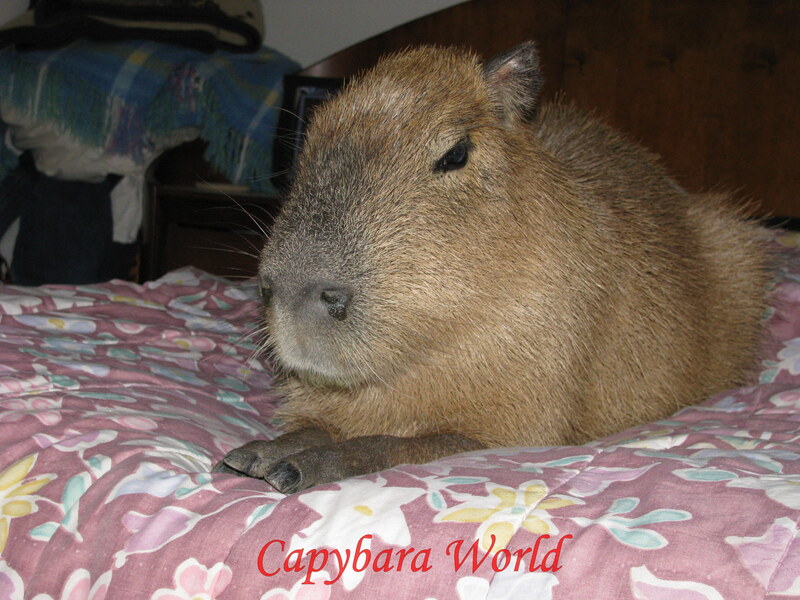 All my friends who live with guinea pigs think they are very similar to capybaras except in size. Amazing animals! So beautiful! I really love rodents. I have rats, guinea pigs and gerbils (which I love most). Capybaras look like their XXL cousins :). I really enjoyed your blog. Thanks for sharing amazing pictures and movies. It helped me to make my capybara 3d model btw. Best wishes. Thank you very much for your comment Paul. I would love to see your 3-D model. I agree about rodents. 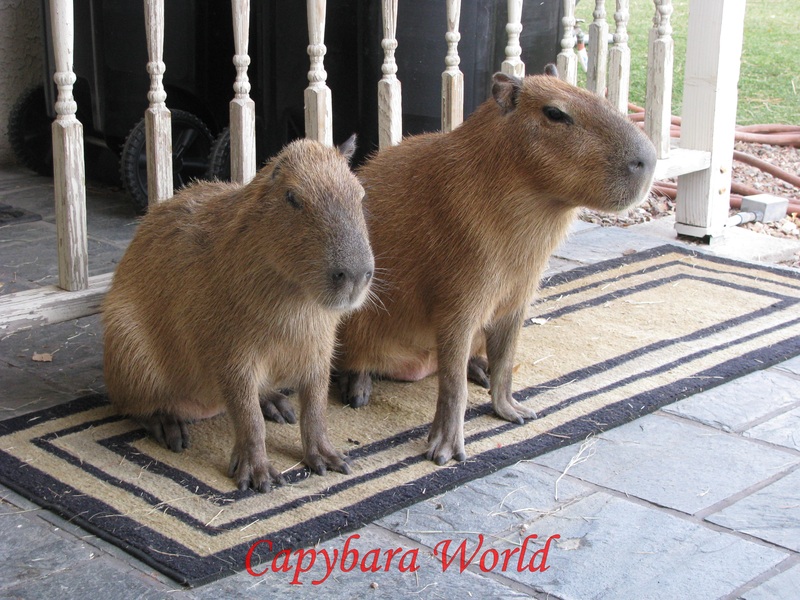 I’ve never lived with rats, guinea pigs or gerbils but from what friends with guinea pigs say they do seem very similar in many ways to capybaras. 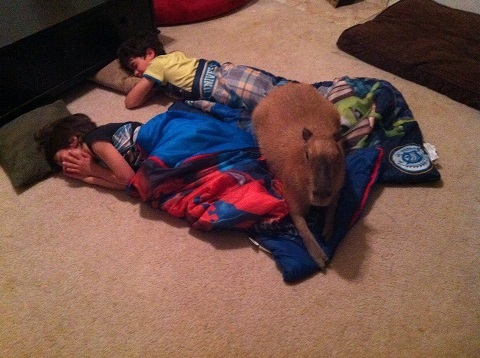 One friend says his guinea pigs get very upset if he plays one of my videos in which a capybara emits a distress call. I was very interested in your comment that you love gerbils the most.